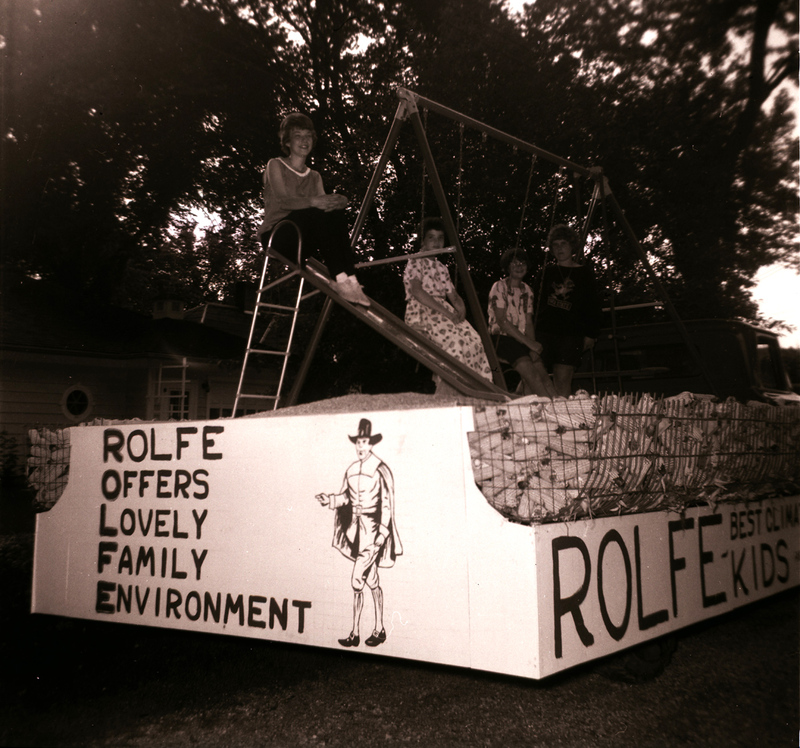 This photo is of my dad’s (Deane Gunderson) 1963 Rolfe, Iowa, centennial parade float, driven by Johnny Zeman*. 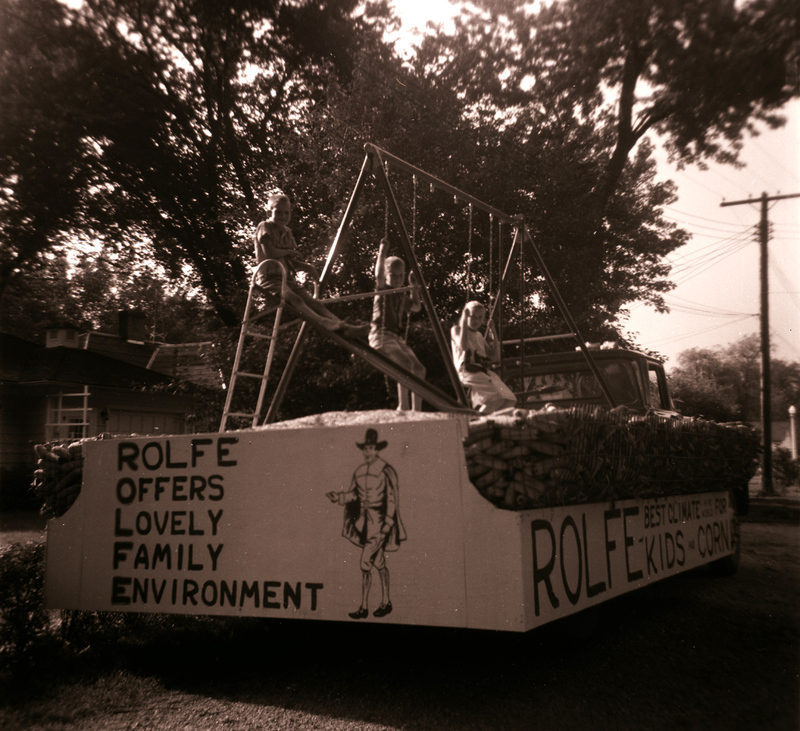 In preparation for RAGBRAI going through Rolfe in 2007, my dad had postcards made to hand out as bike riders visited with him about his Cy statue. This red and gold bordered image is a copy of the front of his postcards. 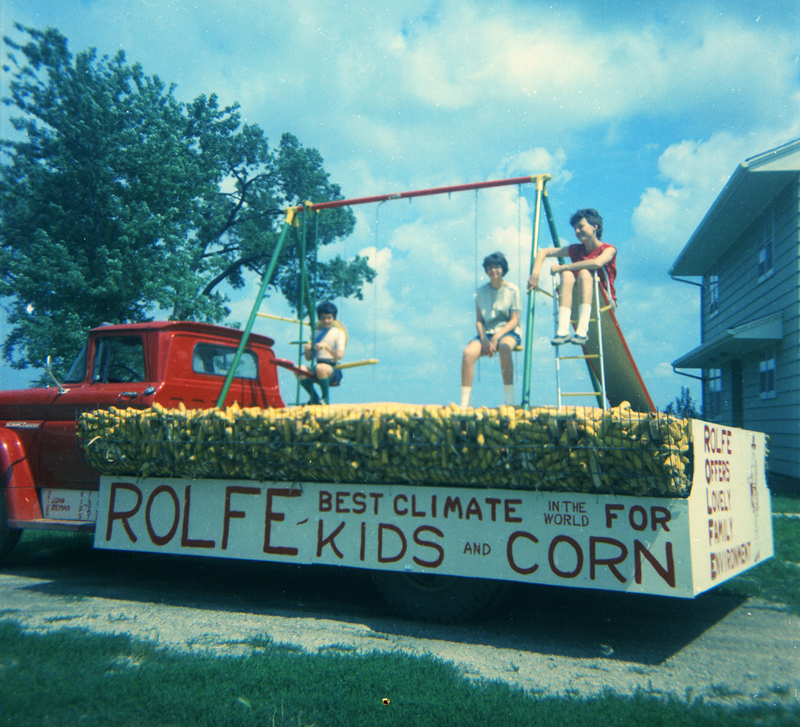 In my certainly-not-biased opinion, Rolfe, Iowa, still does have the “BEST CLIMATE in the WORLD for KIDS and CORN”! 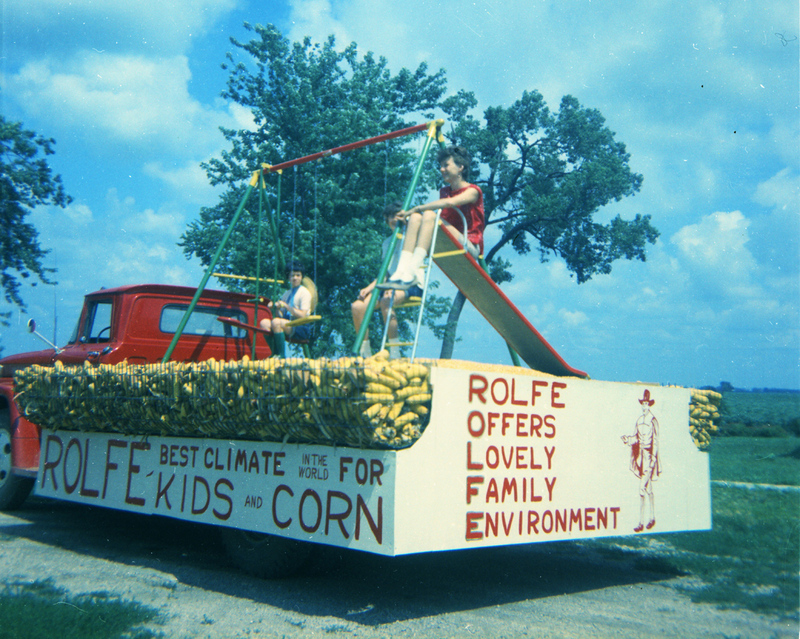 This is especially true during this summer’s drought; the Rolfe area has been blessed with more precipitation than that received by many areas of the corn-producing midwest. 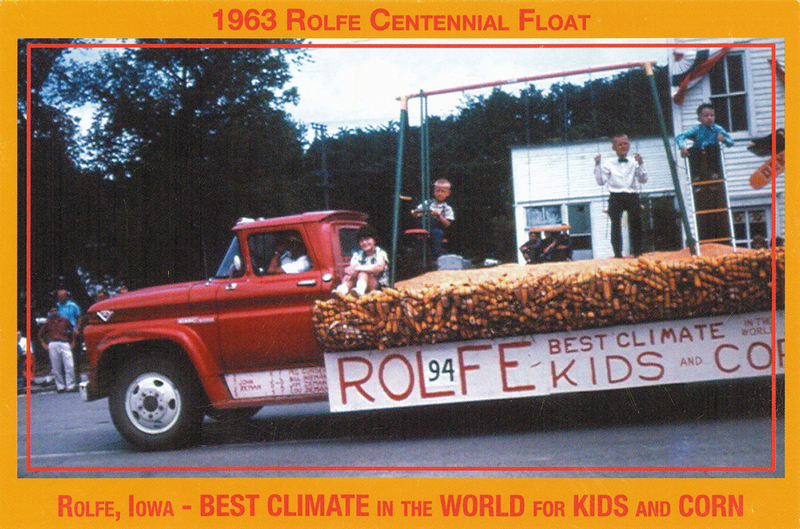 In the most recent post I posted a movie that included the Rolfe, Iowa, 1963 centennial parade. 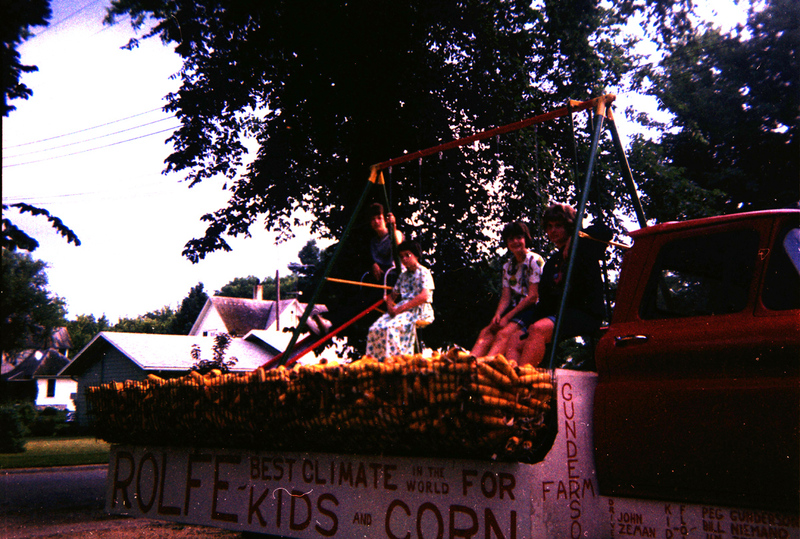 In that parade was my dad’s float. It flashes by at about the 5:55 point of the movie. Below are slide images of his parade entry. They are quite similar to each other. 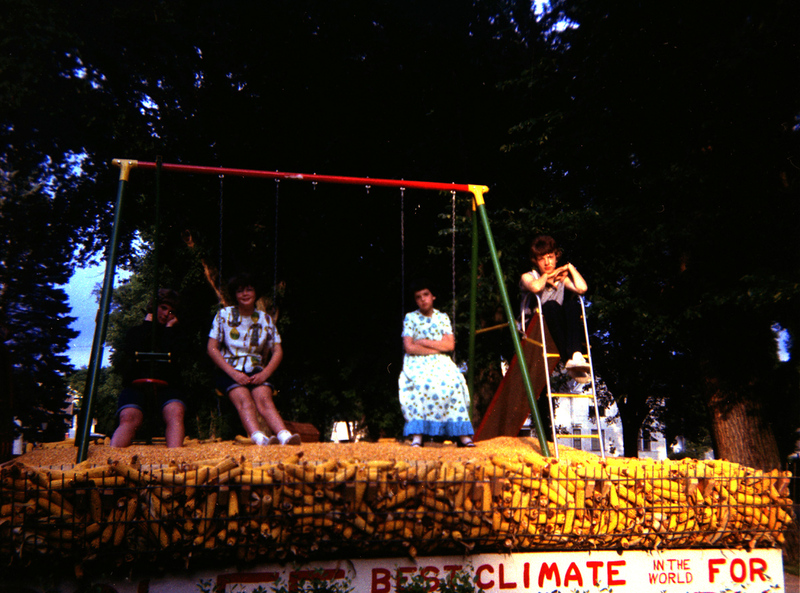 Since I figure my family might want to see all the photos I have of the float (on a chance that each might provide another tidbit re: our formative years), I’m including everything I have. For non-family members, one photo is probably enough, although in each photo I can see a unique flavor. For example, some of the photos were taken at Gunderland (the farmstead where I was raised). I had forgotten we had that great big TV antennae on a rather intrusive big pole. In the black and white photos, I’m pretty sure my grandma’s (DeElda Gunderson) house is in the background. (She died less than a year after this parade.) Also, in some of the photos, I’m the only one wearing a centennial dress. I wonder why I was the “lucky” one! Hmmm…since the parade was in the first week of July, my dad must have saved this corn from the previous year????? Click on a thumbnail-sized image to enlarge it. Once enlarged, to enlarge even further, click on the “View Full Size” link. ( I think the clicking to get to the full size view is fickle.) Once in full size view, if you click on the image again, it will enlarge even more. Click through the images to view as a slideshow. I’m not sure who these children are, but wonder if they are Johnny Zeman’s. Johnn drove the truck during the parade. *In this post you can see Johnny and my dad putting a Christmas tree on top of a brick corn crib. 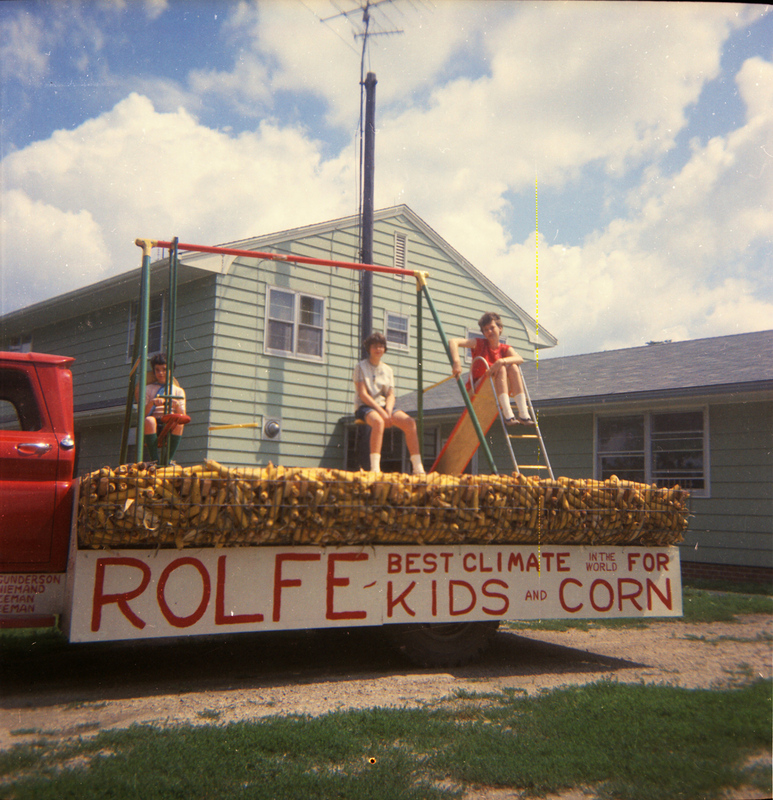 This entry was posted on July 31, 2012 at 6:07 pm and is filed under Deane Gunderson, Iowa, Rolfe. You can follow any responses to this entry through the RSS 2.0 feed. You can skip to the end and leave a response. Pinging is currently not allowed. Louise, I have a lot of catch-up reading to do with regard to your blog – which is always so fun, interesting, enjoyable… Gosh, don’t you wish you could read our minds in the photos? Fun to see; thanks for sharing.